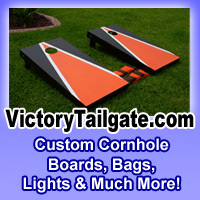 I play with the "Missouri Style" washer toss -- a square wooden box with a PVC pipe in the middle for the ringer. I have started playing with the boxes lined up to each other as diamonds rather than squares. So the corners of the two boxes are pointed toward each other rather than the faces of the boxes. Since you throw along a line from box to box, it seems like it is a little easier to get it in the box. I'm not sure, but our family likes that method.